Our school bank in conjunction with Salford Credit Union has been running since February 2012. We have 30 members of the bank who have collectively saved around £2400 over this period of time. As a school we firmly believe in teaching our pupils about the benefits of saving and in educating them to be able to manage money effectively which we hope they will take forward into adulthood. 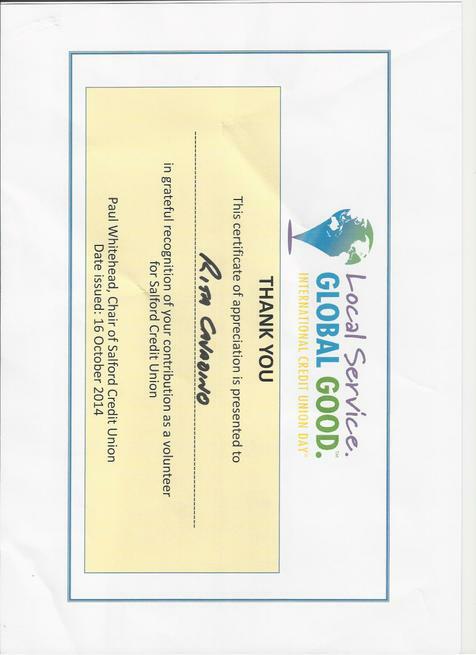 Today we have received a certificate of appreciation for Rita Cavadino in grateful recognition for all her hard work and commitment as a school bank volunteer. Without Rita the school bank would not be in place. Please continue to save with us and if anybody would like to join the school bank then please contact the office for the application form. Many thanks again to Rita for all her hard work and to all the savers here at St. Paul's Heathside Grove.